Victor & Carina Contini's flagship Italian restaurant in a grand former Georgian banking hall on George Street. 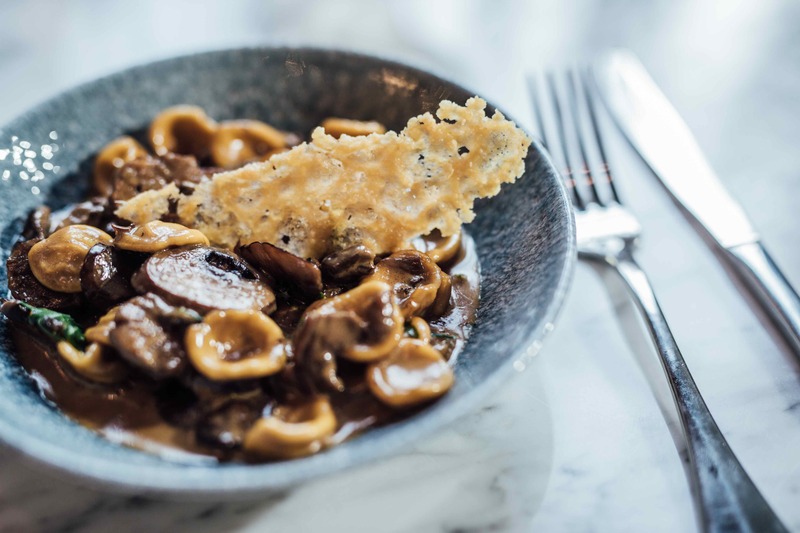 Modern Italian dishes showcasing the very best of Scottish and Italian produce. Perfect for families. 50 wines by the glass. Join us for breakfast, lunch, aperitivi and dinner. Open 7 days a week. Over all a lovely experience and a lovely meal had by all our table. Great touch having the owner pop round to tables to see if everyone was enjoying there meals. Very attentive & good service. I use here often for both business and pleasure. On Friday the service was slow but the food was good. I think the food is delicious and good value for money in the city centre. Service was a bit ‘in your face’. We had asked for a quiet table to discuss business matters. The server kept approaching the table and limiting conversation. Food and wine excellent. Staff were very friendly and attentive but two staff members managed to pour wine from the bottle onto the table, missing the glass. That was disappointing but it’s the only criticism. Maybe a training issue. I’m sure we’ll return soon. Thank you so much for your kind review. I am so pleased that you had an enjoyable experience. I am very sorry that more care was not taken with your wine. We have a few new members of the team who are in the process of wine training but still have a little way to go! I have undertaken some wine pouring training to ensure they are confident in the proper way to serve our wines. Apologies again and we look forward to welcoming you back very soon! Thank you for giving us a review. I am sorry to hear that you felt the service was slow on the occasion you dined with us. We like to ensure that no guests feel rushed during their dining experience unless they request speedy service. However,  it sounds as if on this occasion that we indeed fell short of our high standards and failed to deliver your expectations. At Contini it is our policy not to bring the bill unless requested as we never want a guest to feel as if they are being rushed to leave. We do understand that this does not suit everyone and I am sorry if you did not feel as if you were looked after well enough.We look forward to welcoming you back very soon. An impecable experience in every way. Superb food, in a delightful ambience, served by friendly and attentive staff. We were expected, warmly welcomed and made to feel that nothing was too much trouble. The food, wine and service were faultless. A little glass of complimentary frizzante appeared immediately to toast my husband’s birthday and his dessert also carried a Happy Birthday greeting. We will certainly be back. Thank you so much for your wonderful review. I am so pleased that you enjoyed your experience at Contini George Street and that we managed to help make your husbands birthday a little bit special! Thank you again and we look forward to welcoming you back very soon. Très bonne cuisine italienne dans un très beau décor. Produits super frais, service impeccable. Et pour une fois les enfants ont droit à autre chose qu’un burger. We had a lovely three course meal here with an Itison deal. It was our first meal here. The food was gorgeous and the service was excellent. The surroundings were beautiful too. The only disappointment was that our gin cocktail was just an Edinburgh gin liqueur in fizzy water. It tasted a bit bland without the kick of gin or prosecco. I didn't drink mine but the waitress didn't comment when she took it away. My husband didn't think much of his but he did drink it. We ordered wine instead, so it felt like that aspect of the voucher didn't fulfill our expectation, and we felt a little cheated, in what was otherwise an excellent meal. Thank you for taking the time to review Contini George street and provide us with some valuable feedback on your dining experience. I am so pleased to hear that you had an enjoyable meal and felt well looked after by our friendly, knowledgeable team. I am sorry to hear that the Edinburgh gin cocktail was not to your taste. It is intended as a light refresher before the start of your meal and your waiter should have explained what the drink contained. I am sorry if this did not happen and you were left underwhelmed. I do hope you choose to dine with us again so we can show you some authentic Italian hospitality. My wife and I had an excellent luncheon experience and I have told friends so,that we will return. We thoroughly enjoyed our lunch, the food and service were great and the building itself is stunning. I would definitely recommend Contini. We booked late for the 5 course taster menu. The food was delightful and the service excellent. Venue itself was stunning and old revamped back with large columns. Fully recommend based on our experience. Thank you so much for taking the time to review our restaurant. I am so pleased that you enjoyed our La Dolce Vita 5 course tasting menu. It is a wonderful way to dine which enables you to relax and simply enjoy some delicious food and each others company without the added stress of deciding between our vast array of Italian dishes. We look forward to welcoming you back very soon. Amazing place with absolutely good food and great service. Wonderful value for money. Thank you so much for taking the time to review your experience at Contini George Street. I am so pleased that enjoyed your meal and felt well looked after by our lovely team. We look forward to welcoming you back very soon. I had a lovely lovely lunch with work colleagues we all had 3 courses and everyone enjoyed all of their dishes. There were 2 vegetarians who were happy with the vegetarian options available. The staff were very knowledgeable and attentive. Would definitely recommend this restaurant. Another delicious meal, beautifully presented the service was excellent as always. Highly recommended ! We have visited Contini George Street several times, including a family birthday lunch in the private dining suite and have never been disappointed.Our latest experience was no exception and although enhanced by the grand surroundings, the restaurant provides an authentic family Italian/Scottish ambience. Would recommend to tourists and residents alike. Fantastic dining experience. Wonderful decor, food and service. Have already booked a return visit! Great food, service and excellent pricing for a business meal.